Since Eric was not able to coach Sundays we were able to substitute him with Volen. Volen owns Progoalkeeping and has partnered with CFA on Sundays and during Summer Camps. As a former professional goalkeeper in the first and second division in Bulgaria he played for Spartak FC, Olympic FC, Granichar FC and Tundja FC. 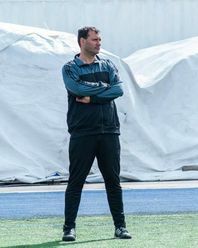 Volen holds the Canadian C Licence, National Y Licence from the United States Soccer Fedration (USSF) and Advanced National Goalkeeping Diploma from the National Soccer Coaches Association of America (NSCAA) in the USA. He has coached Wexford U15 (girls), Woodbridge FC (goalkeepers), Scarborough Blizzard U11 (boys), as well as a series of Leaside Rep. teams. Recently he became Toronto district head coach U12.